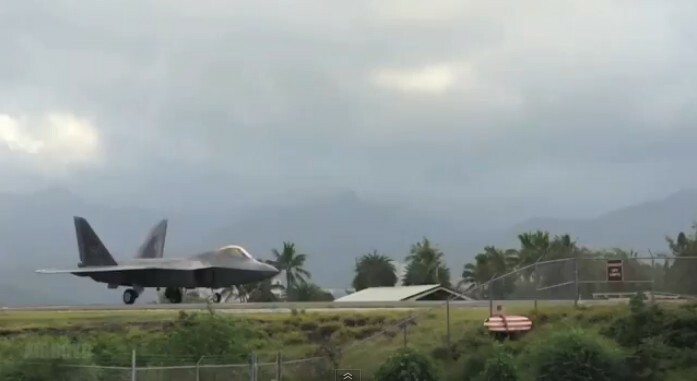 The following video, shows F-22 Raptor stealth fighters flown by the Hawaii Air National Guard’s 199th Fighter Squadron and the active duty Air Force’s 19th Fighter Squadron takinv off during an early morning 14-ship sortie rotation. Note at the 00:30 mark the surfer carrying his surfboard and walking next to the airport’s fence as one of the radar-evading planes taxies: a scene that can be seen only at the Hawaii…. As the units were being readied to declare FOC (Full Operational Capability), on Apr. 7, the squadrons launched and recovered a record number of sorties which is the most executed by these squadrons on a single day since the conversion to the F-22s.